Home » Local News » The Solar Cooking Site is up! The Solar Cooking Site is up! 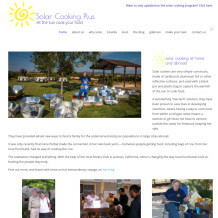 Moke Hill’s favorite humanitarian Irene Perbal has a new web site for her solar cookers program — http://solarcookingplus.com. Irene discovered solar cookers from her daughter in Glencoe. In 2008, with sponsorship from the Jackson Rotary, she and her husband Michael traveled to Brazil to bring cookers to underserved populations, and train the locals in how to build and use this simple, inexpensive method for cooking food using only the sun for heat. They did workshops and demonstrations for groups ranging from local banks to groups of poor fisherman and garbage collectors. After changing lives for the better abroad, Irene made a simple but profound connection here at home. In talking to people from the local food banks in Calaveras and Amador, she realized that some of the food distributed by the banks get tossed in the garbage, by people who have no means to cook it. Again sponsored by the Jackson Rotary, she has been busy “training the trainers” in our home territory, and letting people know about this simple solution. Follow her story on the site.